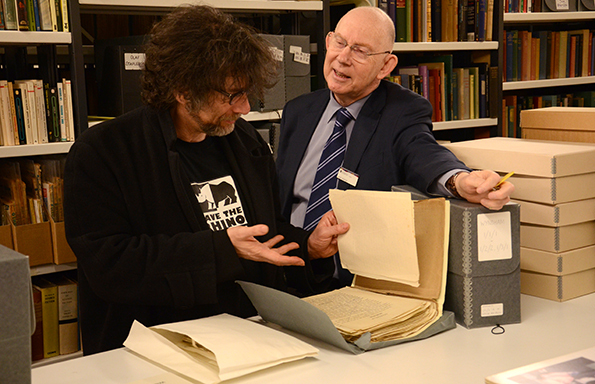 The University of Liverpool’s Special Collections & Archives (SC&A) was awarded Archive Service Accreditation – a first for a North West University. Housed in the Sydney Jones Library, SC&A cares for and makes available in perpetuity the unique and distinctive collections of the University, in support of strategic priorities in teaching, research and public engagement. SC&A Manager, Jenny Higham said: “This award is recognition of the team’s ongoing efforts to ensure collections are both accessible and preserved for the long-term, but will also act as a platform to facilitate the development of our services and collections for the future, including managing digital archives”. A rich resource, SC&A collections include medieval and Renaissance manuscripts; modern literary papers, notably those of Science Fiction and Merseyside authors; the Cunard archive; the papers of former University Chancellor Lord David Owen; and an extensive institutional archive charting the history of the University and its staff and students. As well as providing a research and enquiry service to members of the University, those of other educational institutions across the UK and worldwide, members of the public, and the media, SC&A offers teaching sessions and student placements, and collaborates with academic and heritage partners locally and further afield in exhibitions and other outreach activities. Accreditation is the UK quality standard which recognises good performance in all areas of archive service delivery, and is awarded by a Committee representing the entire archive sector. Achieving accredited status demonstrates that SC&A has met clearly defined national standards relating to management and resourcing; the care of its unique collections and what the service offers to its entire range of users.